In the final version of Windows 8, click on the bottom left of the button on the screen – which previously was located on Start – starts the interface Metro (or Modern, as now he is called Microsoft). The new panel interface is completely different from what was used on the desktop Windows, and much like Windows Phone. Many users, however, in any way won’t decide on the new interface. Personally, I use Windows 8 in a few months, still can not figure out if he likes me or not. Getting used to it takes some time, which is why I do not draw conclusions. Apart from me, there are plenty of people have already given up the new interface, and comment on them online. Everyone loves to remind Microsoft about what the bad was its previous operating systems, such as ME and Vista, and state that Windows 8 will be no better. But we still believe that Windows 8 has a lot of nice features and will be able to provide us with a lot of positive impressions. Recently, works hard advertising campaign Microsoft, trying to clarify a number of enhancements for people Windows 8. And improvement, we have to admit, there really is. Overcoming two preview-version and reaching the final stages of development, Windows 8 was faster than Windows 7. We all know that Windows 8 is loaded and shut down very quickly. It is possible that the inevitable contamination of the operating system eventually bring its infamous fruit (as it comes with Windows 7), but so far the system seems faster. I was particularly surprised, because a lot of difference in the performance of common tasks, I was not expecting. Yes, this is my personal observation, but later I will try to confirm actual figures. I remember after the release of Vista, I compared it with XP, and very disappointed with the results. Windows Vista, on the whole, seemed unfinished. That was also the drivers and therefore its performance in games and other applications, in most cases, worse than XP. To compare Windows 7 with Windows 8 we measure and compare the performance of various aspects of operating systems, including boot and shutdown, the file copy, encryption, performance, browser, games, and some synthetics. The following tests were carried out on our high-performance system with an Intel Core i7-3960X, 16GB of DDR3-1866 and the GeForce GTX 670. All this is set to the new motherboard Asrock X79 Extreme11. The main drive has a hard disk drive Samsung Spinpoint F1 1TB, while the SSD-drive Kingston SSDNow V + 200 256GB used for the AS SSD Benchmark tests and Explorer Windows. From the hard drive Samsung Spinpoint F1 1TB HDD, the new Windows 8 is loaded to 33% faster than Windows 7. If Windows 7 boot in 27 seconds, then Windows 8 on the same took only 17 seconds. This is a significant improvement, which means that the lucky owners of SSD-drives will be able to download Windows 8 just a few seconds. Such an improvement can be noticed when you exit Windows. In Windows 8 to shut it took only 8 seconds, while Windows 7 on the same computer will be shut for 12 seconds. First out of hibernation, we tested on a standard hard drive. Here Windows 8 also showed a significant improvement, although we believe that even 10 seconds – it’s too long. Then we test Windows 8 on your SSD-drive, and got the same 10 seconds of waiting. Some notebook manufacturers claim that their current laptops with Windows 7 can come out of hibernation in less than 5 seconds. Looking at this time, we can only assume that the operating system determines the fact of using a laptop and applies to it a special energy-saving features, due to which, and the difference is achieved. 3Dmark 11 is mainly used for measuring the graphics performance in 3D, and its important role is played by the video card drivers. So far, the performance of operating systems in the plot was almost the same, although it was still a slight advantage with Windows 7. Multimedia performance, according to Microsoft, is another strong point of Windows 8. And as you can see in PCmark 7, Windows 8 was 9% faster than its predecessor. 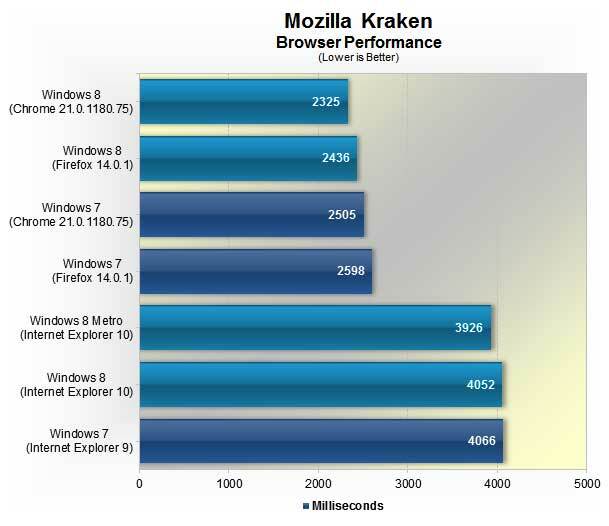 With this assessment, as Mozilla Kraken, we compared the performance of Windows 7/IE9 with Windows 8/IE10. As you can see, the desktop IE10 on Windows 8 showed almost the same performance as that of IE9 on Windows 7. At the same time IE10 for Metro (Modern) was 3% faster, reducing the time to just 3926ms. In the evaluation, we also added the latest versions of Firefox and Chrome. Besides the fact that they went IE, in tests on Windows 8 they were slightly faster than on Windows 7. Another test was browser-Google V8. This test gives the scoring. And the more, the better. Once again we see how the desktop browser IE10 in Windows 8 is very similar in its effects on IE9 in Windows 7. Although this time, version IE10 for Metro was much slower than IE9, behind a full 21%. Huge advantage over IE in this test showed Chrome and Firefox. Moreover, under both Windows 8 browser is faster than Windows 7. 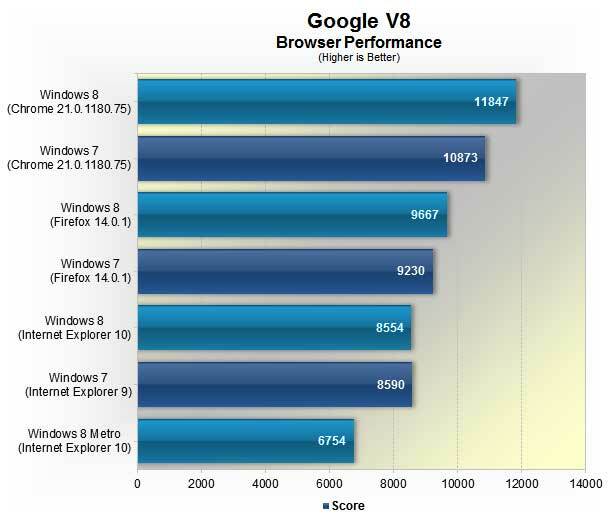 Rating PCmark7 showed us that in the tests multimedia Windows 8 faster than Windows 7. 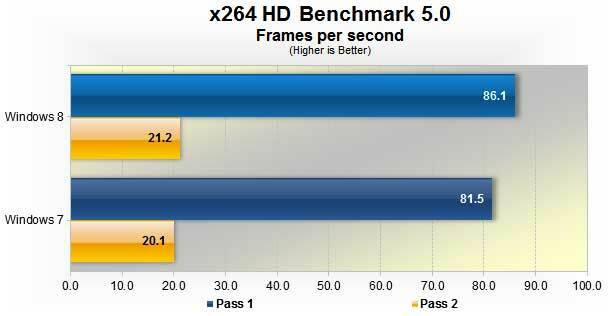 A similar result has given test x264 HD Benchmark 5.0, who prefer the latest operating system from Microsoft. Here she showed 6% advantage. At the same time, HandBrake the difference in performance of operating systems has been minimal. Although she was. And she was on the side of Windows 8. The difference was 1.5%. Windows 8: Is It Worth the Upgrade from Windows 7? You know so many people have negative thoughts on Windows 8 (right or wrong) that it has tainted the perceptions of the actual performance. But as with anything, if you don’t like it you don’t like it. Does not mean that its a lousy product. Just that people don’t like it. What bothers me the most about Windows 8 is that its obviously that its a good OS. But it is also obvious that users don’t like the new User Interface on PC’s. So why doesn’t Microsoft really just fix it? I am not talking 8.1 as “fixing it”. But I mean give users back a option to get Start menus and the Start button back and really put to rest the tile interface issue?